“Build more traditional water infrastructure” is increasingly the wrong answer to the wrong question. Except for basic needs like drinking, cooking, and washing, we don’t want to “use” water – we want to grow food, produce semiconductors, generate electricity, and provide other goods and services society demands. These activities and products often require water; but they almost always can be done with less water than we currently spend on them. The question we should be asking is: how can society satisfy its demands for goods and services with less water – in other words, how can we improve the efficiency and productivity of water use. And the answer is the potential for improving water-use efficiency is massive, and tapping that potential is far faster, cheaper, and more environmentally sound than new traditional supply infrastructure. The Pacific Institute has produced a long series of assessments of water-efficiency potential for urban use and agricultural use for California, the Colorado River basin, cities like Atlanta and Las Vegas, and more. That potential is huge, even in regions where water conservation and efficiency efforts have been pursued for many years. In 1980, almost all toilets in use required around six gallons per flush. In California households, the total amount of water used for toilets in 1980 was around 760,000 acre-feet per year (250 billion gallons per year). If there had been no change in technology or state and national standards to improve the efficiency of toilets, water usage today for toilets (given population growth, and using estimates for 2010) would be around 1,200,000 acre-feet per year (around 390 billion gallons per year), a massive increase of more than 440,000 acre-feet of water. First California, and then the United States, passed efficiency standards for home appliances, including toilets, showerheads, and washing machines. Today, all toilets sold in the U.S. must use 1.6 gallons per flush or less; all toilets sold in California must be 1.28 gallons per flush or less (and efficient modern toilets are tested and work better than the older models). The Pacific Institute estimates that water used statewide for toilet flushing is now around 550,000 acre-feet per year (180 billion gallons per year). Because of this single change in water-use efficiency, for a single water-using appliance (albeit an important one), California not only saves more than 640,000 acre-feet (210 billion gallons) of water every year, but we use less water today for toilet flushing than we used in 1980, even though the state’s population has grown by 60 percent. 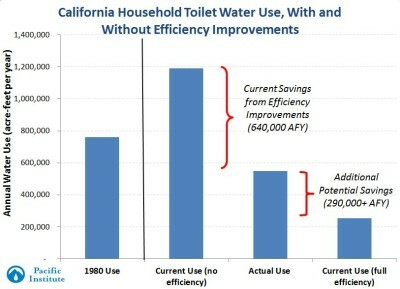 Toilet efficiency standards alone are already saving California more than 640,000 acre-feet a year compared to 1980 use. And another 290,000+ acre-feet could still be saved if all toilets met the current standards. But that’s not all. There are still plenty of inefficient toilets out there: If every toilet in the state were as efficient as the current standard, California could reduce total annual water demand by 290,000 more acre-feet (95 billion gallons a year). That is far more water than any new reservoir proposed in the state could generate, at far lower cost. And the newest toilets use even less than the current standards; technology doesn’t stand still. Figure 1 shows all of these numbers: 1980 use, what 2010 use would have been with no efficiency improvements, actual current use, and additional potential savings. And even that’s not all. What about washing machines, drip irrigation systems, leak reduction in homes and businesses, improved irrigation, and replacing lawns with low-water-using gardens? All together, the Pacific Institute calculates that existing technology can help meet our demands for water services and yet cut actual annual water demand for cities in California by as much as 2.9 to 5.2 million acre-feet (0.95 to 1.7 trillion gallons a year) – massive additional savings from efficiency improvements. Even more water could be saved in the agricultural sector through efficiency improvements. Water conservation and efficiency is just one response to California’s extreme drought and longer-term water challenges. But they are the most important pieces, and ones with the greatest potential at the lowest costs. Without previous efforts already made to improve efficient water use, California would be deeply crippled by the drought. Continuing to improve water-use efficiency must be the core strategy for dealing with unavoidable future droughts and our long-term water challenges. This blog was originally published in the Huffington Post and National Geographic ScienceBlogs. I haven’t seen economic calculations by Pacific Institute (though haven’t looked closely). I know that the Alliance for Water Efficiency’s Water Tracking Tool provides a library of key measures with estimates of measure cost, annual gallons saved, and measure life (which can be used to create a levelized cost). There is also a publicly-available conservation potential study for the State of Wisconsin developed by CDM (see psc.wi.gov/conservation/documents/waterEfficiencyDec2011.pdf) that provides cost-effectiveness information on a variety of conservation measures.